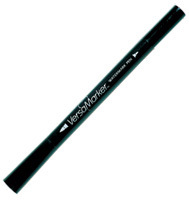 All the same great properties as the Versamark inkpad but in a double ended pen format. One fine end and one brush end, so now you can emboss your had written or drawn images. Really useful for "patching up" any tiny areas you may have missed when you're stamping.